President Abdulla Yameen Abdul Gayoom (born. 21 May 1959) is the incumbent President of the Republic of Maldives, since 17 November 2013. As the Head of State and Government, he is also the Commander-in-Chief of the Armed Forces and the Police. President Yameen is a founding signatory and former Leader of the Parliamentary Group of the Progressive Party of Maldives (PPM). With his assumption of office, he continues to serve on the Governing Council of PPM, as the Party’s first “Musthashaar” (Chief Advisory). After completing primary and secondary schooling in Majeedhiyya School in Male’, President Yameen obtained a Bachelor’s Degree in Business Administration, at the American University of Beirut, Lebanon. Later, he obtained a Master’s Degree in Public Policy from the Claremont Graduate School in Los Angeles, California. President Yameen began his government service in July 1978. Following his undergraduate studies in Beirut, Lebanon, he returned home in mid-1982 and served first as Secretary at the Department of Finance and then as Research Officer at the Research and International Organisations Division of the Maldives Monetary Authority (MMA). On his return after completing his postgraduate studies, President Yameen began what would be a two decade long record of service in the Ministry of Trade and Industries. Among the posts that he had held there were Foreign Trade Development Officer, Undersecretary, Assistant Director, Deputy Director, Director, Director General and then the Minister of Trade and Industries on 11 November 1993. As the Trade Minister, President Yameen modernised the Maldives’ trade sector, broadening the economy and bringing in more investments to the country. He was a key player in the economic development of Maldives upon becoming a Member of Multilateral Investment Guarantee Agency (MIGA) and other international trade and investment organisations. In addition to his services as the Minister of Trade and Industries (and later as the Minister of Trade, Industries and Labour), President Yameen also served as the Minister of Higher Education, Employment and Social Security (July 2005 – April 2007) and as the Minister of Tourism and Civil Aviation (September 2008 – November 2008). President Yameen’s reputation as a visionary, efficient and result-oriented corporate chief executive was enhanced, even before assuming office of the President. His appointments and interventions as the Chairman of the State Trading Organisation (STO), in November 1993 and the State Electric Company Limited (STELCO), in June 1997, saw a dramatic turnaround in these two companies’ fortunes. In less than a few years, STO and STELCO began generating appreciable profits and had gained a favourable reputation for quality of service. During his illustrious career, Yameen also served as the Chairman of the Island Aviation Services (IAS). He also held the post of Vice Chairman of the Addu Development Authority. In May 2004, President Yameen was appointed as the Chair of the Machchangolhi Ward of Male’. One of the four wards of the capital at the time, President Yameen focused on the development of education and social harmony among the residents. Machchangolhi also enjoyed a period of unprecedented success in numerous national competitions, particularly in arts and crafts. During his tenure, he supported the growth of Ahmadhiyya School, which soon became the top primary and secondary school in Male’ by examination results. President Yameen served as a Member at the People’s Majlis (Parliament) for two decades before he was sworn into office as President on 17 November 2013. He entered into parliamentary service in 1993. President Yameen initially served as the Member for the South Miladhunmadulu (Noonu) Atoll Constituency, and went on to be elected for four successive terms. In his final term, he was elected as the Member for the Mulaku (Meemu) Atoll Constituency. 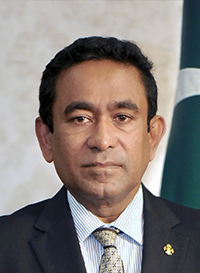 President Yameen was serving as the Minority Leader of the House, when he was elected as the President. In the People’s Majlis, Present Yameen was renowned for his intellectual contributions to Majlis debates. He was also a strong advocate for finding legislative solutions to economic issues. President Yameen earned a reputation as an esteemed economist and corporate strategist for his cogent arguments during budgetary debates. Through his years as a senior parliamentarian, he served as the Chair of both Standing Committees on National Security and Economics. During former President Maumoon’s tenure, President Yameen played an active role in formulating many of the legislations related to trade and economy. During the final term in office of former President Maumoon, President Yameen was at the forefront of the implementation of a myriad of democratic reforms, particularly through the legislature. Among his most vocal contributions were the lowering of the voting age to 18 years and the framework of the current Constitution of 2008. President Yameen was a Member of the People’s Special Majlis (the Constitutional Assembly), that drafted the Constitution. With the introduction of pluralist politics in 2005, President Yameen played a key role in the registration and initial development of the Dhivehi Rayyithunge Party (DRP). Later, President Yameen formed the People’s Alliance (PA), of which he was the Leader. In 2011, he joined forces with the reformists in the DRP – led by former President Maumoon, to form the Progressive Party of Maldives (PPM). President Yameen was the architect of the Party’s almost overnight electoral success. In less than two years, PPM had secured no less than 20 victories in bi-elections for vacant seats in local governance and for the People’s Majlis. The winning streak culminated, in November 2013, with the remarkable presidential elections success for the PPM ticket, bringing President Yameen to leadership. The Islamic University (IUM) was established, in January 2015, with the vision to introduce doctorate level education and to be a centre of excellence in Islamic learning. It was born out of President Yameen’s ambition to move the institution of Kulliyah Al- Dhirasaathil Islamiyah forward and to offer proper Islamic learning and promote a deeper understanding of the Islamic faith. The University has formed strategic partnerships with key institutions, such as Islamic Forum for International Humanitarian Law (IFIHL), while also having received commitments for resource and capacity building from Saudi Arabia, Qatar and others. President Yameen is committed to the vision of the Islamic University of Maldives being counted among the best in the region to provide Arabic and Islamic education – he continues to work towards this vision through strengthened legislation and a push to ever improve technical capacities. The last quarter of 2015 saw the establishment, via the State Trading Organisation (STO), of a pharmacy on every inhabited island in the Maldives allowing all Maldivians equal access to medicine – this was a long held vision of President Yameen finally come to life. Coupled with the state’s healthcare scheme, access to medicine is the most convenient and the least expensive it has ever been. President Yameen has further pledged to improve healthcare facilities to include better treatment of cancer patients and those with heart ailments – in addition to committing towards improving investigative, and other technical capabilities. In line with President Yameen’s vision harbour protection, sanitation and uninterrupted energy initiatives are being implemented around the nation at a blistering pace. By the end of President Yameen’s term more Maldivians will have access to clean water and uninterrupted power than in any previous administration – covering a wider geographic area and acting as an agent of change which will ensure sustainable improvements for generations to follow. Within President Yameen’s first two years in office he brought about an unprecedented reduction of the state budget deficit from double figures to near five percent – the healthiest Fiscal position the country has seen in decades. Efforts such as the ‘2016 Visit Maldives Year’ initiative and mega-infrastructure projects, such as the bridge linking the capital city directly to the airport and the airport expansion, have set the agenda towards widening prospects for growth and gains – the focus being on growing, promoting and putting into place mechanisms towards sustaining and maintaining economic growth well beyond the current administration’s term in office. Development of regional airports is further set to contribute to growth. Son of Sheikh Abdul Gayoom Ibrahim (Maafaiygey Dhon Seedhi) – an eminent judge, President Yameen is the brother of former President Maumoon Abdul Gayoom. President Yameen has been an enthusiastic sportsman from his schooling years, with football and cricket as his preferences. He is also an avid historian. He is married to Fathimath Ibrahim Didi. They have three children – two sons and a daughter.